SOUTHAMPTON, 20-Sep-2018 — /EPR Internet News/ — As social media has experienced considerable exponential growth-rate over the past decade, sadly the same has occurred with online hate speech. Clear evidence of this picture is the fact that different international organisations, including the United Nations Human Rights Council, the European Commission against Racism and Intolerance, and national governments across Europe; namely the UK, Germany, France and Italy, have demanded that the large corporations behind the major social media platforms do more to address this issue. In fact, recent sociological research reveals that, while more needs to be done at the corporate level, there is also other actions that could be taken by national governments and educational bodies towards changing this picture in the near future. 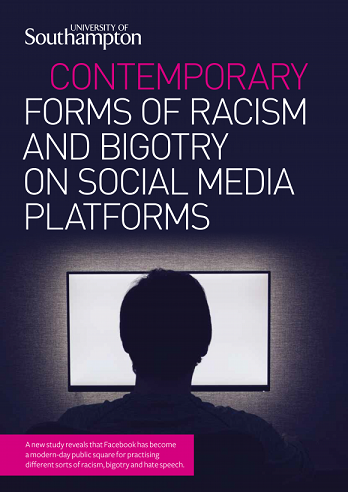 To this end, Dr Luiz Valerio P. Trindade, has undertaken a four-year qualitative study addressing the social impacts of hate speech, racism and bigotry on social media platforms. Based on that, he has developed key recommendations that could stem the practice and help to prevent this phenomenon taking place and laying the foundations for reducing their occurrence in the years to come. With research revealing that even individual Facebook posts with racist and hate content can continue to engage users for up to 3 years after the initial publication, far from being just one moment of instant communication, hateful posts have a life spam that surprisingly extends over a long period. Perhaps more worryingly, the research evidences that social media is held to be a ‘No Man’s Land’ by the proponents of hate and bigotry, suggesting that these people feel at ease to convey their ideologies believing that authorities cannot reach them. Discussing the consequences of online hate speech with secondary school pupils and helping them to develop a clear understanding of the real life’s impacts and consequences of this practice. This is critical because social media is widely used by the 13-17 years-old age group, with over 1.8 million users of this age in the UK alone and 172 million globally. Educational campaigns at national level to highlight the fact that online life is not detached from offline and that, in fact, they are intertwined. Working to ensure that the large corporations behind the major social media platforms have effective and faster processes to remove inappropriate content that’s been flagged up by their users or spotted by their powerful algorithms. Calling for these corporations to clearly highlight to their users that their platforms are not a safe paradise for them to convey racist views or promote bigotry exempt of consequences. Instead, these corporations need to set out clearly that identification data could be disclosed to the authorities, who could then hold them to accountable for their online attitudes. Dr Trindade, PhD in Sociology by the University of Southampton says, “The increasing trend of construction and dissemination of hate speech, bigotry, misogyny and racism are apparently becoming the ‘new normal’ in the digital landscape across several European countries and also in the UK. Moreover, rather than fading away soon after publication, derogatory posts oftentimes become powerful magnets attracting several new users for the same conversation for up to three years, what can potentially increase the initial harm caused to the victim of the verbal abuse”.